If you're searching for a casual yet totally stylish look, marry a black linen trenchcoat with a Forever Unique metallic skater skirt. Both items are totally comfy and will look fabulous paired together. Polish off the ensemble with black leather ankle boots. 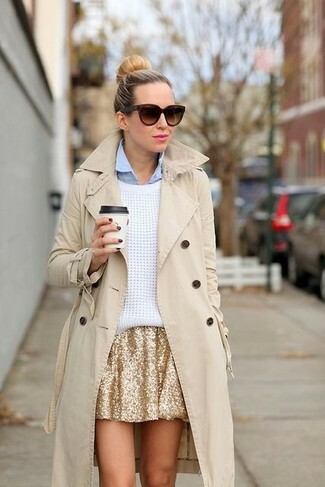 If you're on the hunt for a casual yet chic look, wear a beige trenchcoat and a gold skater skirt. These two items are totally comfortable and they also look great paired together. If you're all about practicality dressing when it comes to your personal style, you'll love this cute pairing of a white cable sweater and a Forever Unique Metallic Skater Skirt from Asos. Up the cool of your ensemble by wearing beige leather pumps. If you're hunting for a casual yet totally stylish look, rock a black long sleeve blouse with a Forever Unique metallic skater skirt. Both garments are totally comfy and will look fabulous paired together. Wearing a pair of black nubuck ankle boots is an easy way to add some flair to your outfit. If you're obsessed with practicality dressing when it comes to your personal style, you'll love this totally stylish pairing of a charcoal crew-neck t-shirt and a gold skater skirt. Make silver leather pumps your footwear choice to kick things up to the next level. If you're scouting for a casual yet absolutely stylish getup, go for a black chiffon button down blouse and a gold skater skirt. As well as very comfy, both of these items look great when paired together.